Sweet Seasons is a set from Stampin' Up that I really enjoy using -- there's one that applies to each of the four seasons. This one, of course, is for summer. 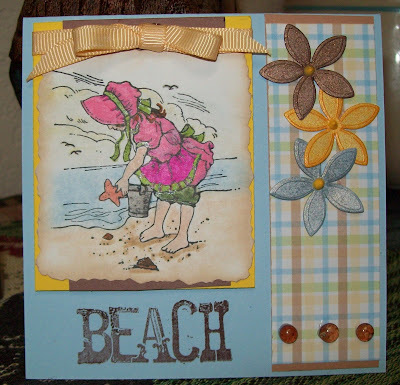 The "BEACH" is a part of the "A Shore Thing Collection" from Snag'em Stamps that I had ordered last year when I was stamping some "Save the Date" cards for a friend's wedding in the Bahamas. The card is one of those little ones (4.25 x 4.25) that I just love to make. I hope you like this card as much as I had fun making it.